Welcome to a fun challenge this week for Watercooler Wednesday! This week, it’s Anything with a “B” – use an element on your project that starts with the letter B – and you’re set to enter! This is one challenge you can certainly get creative with – how about a beach ball on a blue beach background?! (no need to be alliterative – that was just me having fun). I managed to fit in 3 B’s – blooms, butterfly and bees! I’ve been dying to try out the new Sliding Star Framelits, so I thought – why not a butterfly, swooping between the flowers? DEMONSTRATOR TIP – make sure that when you attach your two pennies together – use your Paper Snips to round off the corners of the Stampin’ Dimensional. That way, the edges of the Dimensional won’t stick to the cardstock as it spins along the slider track, and your butterfly (or bee, or star, or whatever you choose) will spin along with no glitches. I created my own background using the images from the Garden in Bloom stamp set, stamping the outline of the flowers, leaves and bees in Memento Black ink. The large flowers were stamped in Flirty Flamingo, the small flowers in Dapper Denim (stamped off once) and the leaves in Mint Macaron. The body of the bees are Daffodil Yellow, and the middle of the large flowers are Peekaboo Peach. After stamping my background, I used the partial circle framelit to die cut the area for my slider. I placed a piece of the Foam Adhesive Strip about 1/2″ above and below the die cut area (make sure that it doesn’t hinder your slider pennies), then I attached Stampin’ Dimensionals on each corner of the piece, and attached it to the Dapper Denim card base. 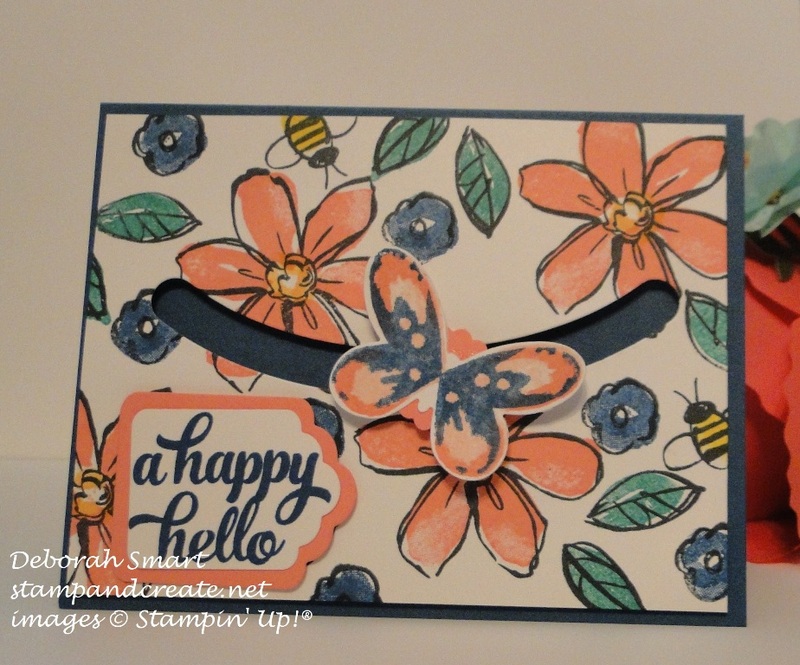 I stamped the butterfly using the Watercolour Wings stamp set; I first stamped in Flirty Flamingo, then Blushing Bride, then finally in Dapper Denim. It was easy to die cut the butterfly using the coordinating Butterfly Thinlits, and my Big Shot. Because I didn’t want the penny to show behind the butterfly, I used my 1/2″ Circle Punch for a piece of Flirty Flamingo cardstock behind the butterfly, and attached it to one of the pennies using a Dimensional. Then, I slid the pennies into the slider area (one penny goes behind the die cut, the other to the front, with the Dimensional in between, and the butterfly in the front). I stamped the sentiment from the Tin of Cards stamp set in Dapper Denim onto Whisper White (full strength – you can see how rich it is), then used the Tags & Labels Framelits to die cut it and the Flirty Flamingo cardstock layered behind it. 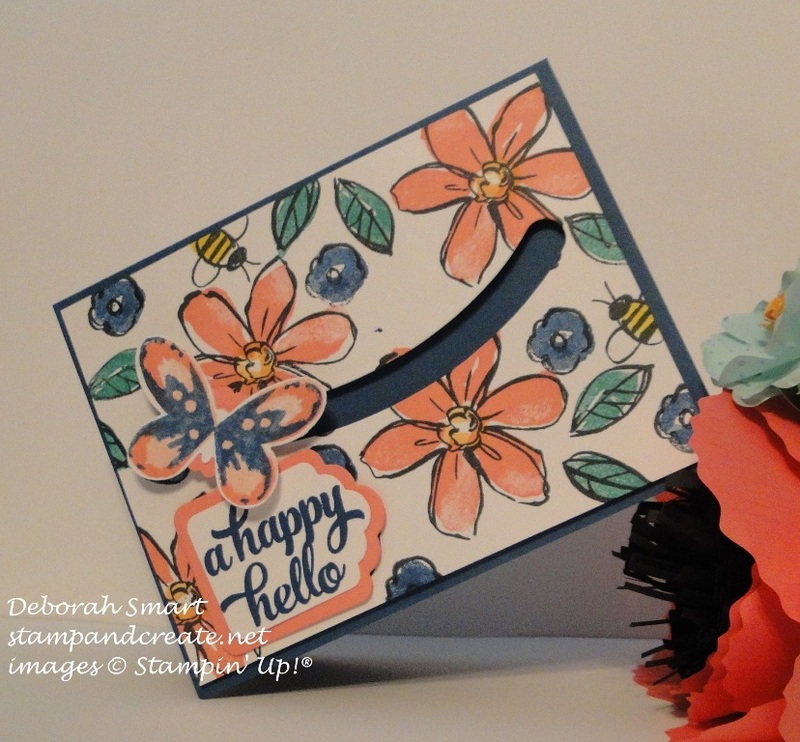 This card was such fun to make, and so easy!! I can’t wait to make a lot more of these, and the full circle ones, as well. The Sliding Star Framelits also coordinate with the Shooting Star stamp set, if you want to Bundle them together for a 10% savings. Caution – once you start making spinner cards, you won’t be able to stop! You’ll have so much fun playing with them, and your friends and family will want them for every occasion! Previous Previous post: Wacky Watercooler 3rd Anniversary Blog Hop! Deborah I’m really liking your spinner card and how you fit it into the “B” challenge. Wow it’s impressive. I like the background you’ve created with Garden in Bloom and Wonderful Wings, both such great sets. I’ve had my eye on that Shooting Star Framelits set, but wasn’t quite sure how I’d use it, now I know! Great card thanks for sharing!